Always be on the look-out for ways to improve the lot of everyone rather than just yourself. Think in terms of 'we' rather than 'I'. You are a part of the team and should fit in and be a part effectively and efficiently. Try to spread a little happiness as you go. Don't badmouth people. Stick up for the under-dog. Compliment people and be genuine about it. Don't indulge in gossip or tittle-tattle. keep your own counsel and be a bit aloof. It'll get you promoted. Dress smartly and try to make a good impression. Maintain high standards and put in hours. Try not to go to work to sleep or steal the pens or look for love. You are there to work, get on with it. Try to be kind to colleagues, they are as lost as you once were. Give them a break, a chance, a bit of slack. Encourage them by example. Be a role model for Junior members of staff. Try to understand your boss' point of view and to see things from the company perspective. Understand the polities of office life––don't get involved of course––but use it to your own advantage. Don't be frightened to put yourself forward or to volunteer(just so long as you know that you are volunteering for). There is no kudos in being work-shy. Be proud of being effective and efficient. Know your boundaries. Know how to say 'no', and mean it. Don't let anyone take advantage of your good nature. Be assertive without being aggressive. Enjoy what you do. Have a passion for your work. Have fun. 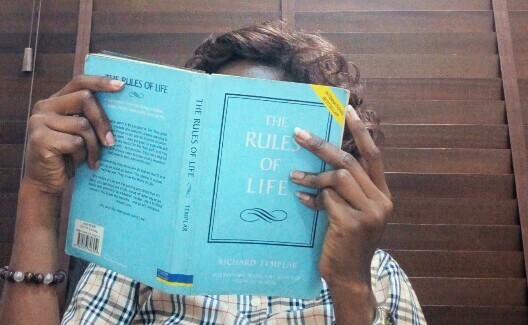 I'm currently reading 'The Rules Of Life' by Richard Templar. A very interesting book filled with practical wisdom. 'The Rules Of Life' contains 100 'rules' that Richard Templar has extracted from his experience of life. This article was culled from RULE 92. P.s It's been months since I last reviewed a book. Got two new books written by two author-friends that I really have to read, and reviews would be considered as gifts. What book are you currently reading? Have you got any rules guiding you at your present job this moment? For me, it's TO FOLLOW PEACE WITH ALL MY COLLEAGUES (Hebrews 12:14) You?